At Home Restoration Professionals, we realize how hectic and overwhelming it can be if your home has been impacted by a fire or flood. That is why we launched an Insurance Claims Center that is now open 24 hours a day, 7 days a week. We will handle every aspect of your insurance claim during this challenging time in your life. Our experts are standing by to take your call and answer any questions you may have. • We process all of the paperwork, get through the red tape, and deal with your insurance agent or representative, so you can attend to more important matters during this difficult period. • Once your claim has been filed, we follow up and update you regularly to inform you of the claim’s status. • We make sure you will receive the maximum insurance coverage you are eligible for by providing your carrier with a comprehensive flood or fire damage report, photos, and our professional restoration recommendations. The last thing you need to worry about after a catastrophe has hit your home is how you will file an insurance claim. By calling Home Restoration Professionals, you can leave the worries to us. You can focus on repairing and restoring your home so that you and your family can enjoy it once again. Our Insurance Claims Center is available to you at no extra charge – it is a service we are happy to provide to you along with our expert home restoration services. Call Downriver’s #1 Flood and Fire Repair Specialists at 1-734-619-7610. 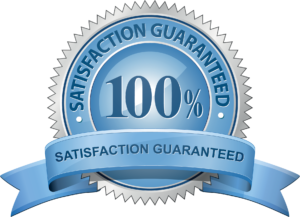 We guarantee our services and assure your satisfaction.